The Mona Lisa is among the most famous paintings in the world—revered for centuries, owned by emperors and kings, and visited in the Louvre by approximately 6 million people annually. 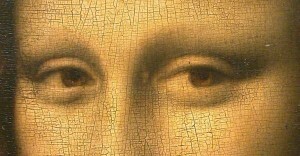 Still, its beauty and impact are diminished for people who cannot see it because of visual impairment. But that may be about to change if either of two crowdfunding campaigns currently on Indiegogo and Kickstarter succeeds. The notion is to “let artists create 3D interpretations of artworks by scanning a photo of the original, then adding depth and simplifying detail.” Then, anyone with access to a 3D printer could access the file, download, and print. The project on Kickstarter from the group 3DPhotoWorks is different in that it is looking to fund a much more expensive, commercial platform for use by museums, science centers, and other cultural organizations. They’ve developed and tested “a process called 3D Tactile Fine Art Printing” that is “capable of converting a painting, drawing, photograph or other form of traditional 2D artwork into a 3D printed tactile fine art” as large as five feet by ten feet. The technology is based on the science of neuroplasticity and inspired by “the work of Dr. Paul Bach-y-Rita, a neuroscientist at the University of Wisconsin-Madison,” which shows “that the human brain is capable of processing the tactile information obtained from fingertip contact like it had been obtained from visualization.” In these cases, sensors have been “implemented into the prints, which when touched, give off audio that tells the user what is being shown at that part of the painting.” In that way, their brain can put together a mental picture of what’s in the painting, photograph or drawing. One aesthetic question raised by this, according to Tech Crunch, is whether “a 3D painting [is] still a painting?” And, in another sense, are the new creations new pieces altogether? Dillon sees this as a differentiation between the two approaches, and describes 3D Tactile Fine Art Printing as “more of a relief style” versus the fully 3D models Unseen Art aims to distribute.” He argues that there’s particular value in the 3D modeling he’s proposing because they found, “there needs to be some depth of touch, and there needs to be some limitation to detail—a perspective on the art, or an impression of the art, for people to really understand it.” Using the Mona Lisa as the best-known example, he says, if you included every bit of detail about the picture, then people aren’t really going to get a lot out of it. Too often people invent ways of describing art to blind people rather than creating authentic means for the blind to perceive visual imagery in nonvisual ways. This technology opens up new avenues for exploration and understanding and will enhance the experience for everyone. This technology also has the potential to allow greater participation by the blind in a wide variety of fields, especially the visual arts and STEM subjects. Many people linger in museums, longing to bring such beauty into their homes, perhaps dreaming of someday investing in artwork. So, what restricts that wish to a dream? For many art lovers and would-be buyers, the art market seems too complex and daunting, or art prices appear economically out-of-reach. To accommodate this widespread but largely unfulfilled interest in art acquisition, many major museums and smaller galleries have started offering rental and rent-to-own programs, such as San Francisco’s MOMA. While art rental has a long tradition, especially among corporate clients, the rent-to-own movement is increasingly gaining popularity. In many cases, the arrangement may benefit the buyer, the selling institution and the artist. Buyers get to see how they like “living with” the painting or sculpture before they commit to a major expenditure. As a result, individuals who would not usually consider purchasing art “whet their appetites” and just might begin a lifelong habit of collecting. In the meantime, throughout the rental period, the gallery makes artwork available to appreciative eyes, which would otherwise be displayed at considerable expense, or kept out-of-sight in storage areas. In the long run, the gallery and artist also benefit, as the pool of potential buyers increases. When a work is displayed in a home instead of a gallery setting, it instantly creates the word-of-mouth buzz that galleries usually labor to generate. Imagine that you’ve just acquired a beautiful piece of artwork, and you may only have it for a couple months: Wouldn’t you tell your friends, show it off with a dinner party or two, and flood your social media streams with proud images? In general, rent-to-own agreements are based around a commitment-free rental period, followed by the opportunity to make a purchase. Beyond that, individual programs can vary widely in the agreement details. According to BBC reports, two or three-month rentals are fairly common. Rental terms of a few months allow individuals to try out living with the artwork without burdening themselves with an excessively long commitment. Pricing can also vary widely. As an example, the San Francisco MOMA might rent out a piece worth $30,000 for a little over $1000 per month. Taxes and installation charges also apply, and insurance costs will also vary. 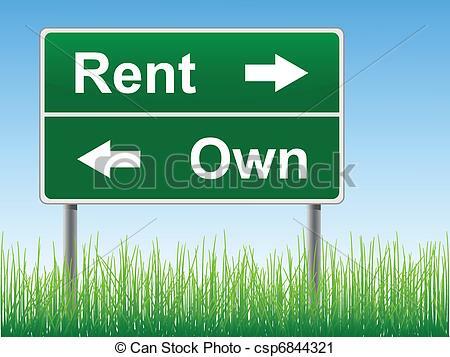 As with any rent-to-own arrangement, should the renter eventually decide to purchase, the final purchase price will be lowered to partially reflect the funds already invested during the rental period. For example, the Seattle Art Museum lets buyers put half of the rental fees toward the purchase price. In general, the rent-to-own arrangement appeals to potential buyers for a few simple reasons. It allows them to enjoy artwork, in their homes, without committing to a major investment. Plus, for those interested in an eventual purchase, beginning with a rental significantly lowers the pressure and the risk of “buyer’s remorse.” As a result, risk-shy investors and novice art buyers are especially likely to find the option attractive. Rent-to-own arrangements also offer a convenient alternative for a range of specific scenarios. For new companies in high-end sectors, acquiring the right artwork is fundamental to creating the office environment that gives clients the right impression. However, the cost of purchasing art outright can prove prohibitive for startups. By choosing to rent, with the option to buy, companies can suit their spending to meet the changing budget of their growing business. Given the increasingly popularity of the rent-to-own arrangement, why should the scheme be of interest to artists? Firstly, by working with galleries that specialize in rentals, artists can massively increase their exposure. Although you may typically imagine your artwork to eventually grace a handsome home, consider how many more people will see a piece that hangs in a workplace. High-end hotels and competitive firms constitute many of the most ardent art renters. Many galleries, such as CKI Fine Art Rental, have specialized services to shepherd such clients through the art rental and rent-to-own process. As an added bonus, letting galleries rent out your artworks ensures that they will be loved and appreciated. Instead of hanging at the back of a gallery, waiting to be purchased, your artwork will be continuously pleasing viewers. And at the same time, a growing public will be getting to know your name. Andre Smith is a writer from Brisbane. His great passion is art – he’s an admirer of Ansel Adams‘ work and Asian fine art. You can connect with him on Google+. What do artists have to know about working with retailers and gallery owners? Don’t think having friends and family like your work means you can succeed in selling to others on a regular basis. Know that being talented is not enough to be successful. Don’t treat all retailers or gallery owners the same; like artists, every retailer or gallery owner is unique and should be approached that way. Don’t assume the store or gallery owner doesn’t understand what it is to be an artist. Just because I own or run a store doesn’t mean I haven’t lived that struggle – in fact, I have and it’s been a double roller coaster. Don’t believe if you’re an artist you can’t be good at business. Operating a successful business is as creative as anything else you do in art. It’s a living thing like a painting, and you have to be very creative to make it work – the skills are very complementary. Realize that the relationship is not just about selling art – it’s much more than that. It’s collaboration between the store or gallery owner and the artist. The more I understand about you and your work, and the more I love it, the better I can translate and convey that to potential buyers. Understand that for the relationship to be successful there should be an emotional and I believe a spiritual connection between you and the person selling your work. Your work is much more than a physical product. Know I need to be able to convey information about your art and about you as an artist – art is part of a person’s soul, and if the artist realizes I’m not just a business person, and we connect, I can sell and speak about who they are in a meaningful way. The art world hasn’t to do with proximity (where you live), who refers you, or how much you sell. If you are producing art true to who you are, you are succeeding. You must, as an artist, do your most authentic work. Someone else can’t tell you how much you can get for your work. I can guide people, but it depends who you’re painting or creating your work for. Ask yourself: Who do you see as your audience? Are you doing it for the masses as a product, or are you creating for another type of buyer? How much time have you put in? What do you think your art is worth? What, in addition to quality of work, makes you want to work with a new artist? For me, that’s the sign of advanced art making. Once an artist thinks they’re past the point of accepting feedback and critique, then they’ve hit a wall and boxed themselves in. Those who are going to grow more are open to teaching. How can an individual help you once her or she becomes one of your artists? The artist should be willing and able to nurture the relationship with me through ongoing dialogue and communication as their work evolves. I want to know how and why that is happening. This continues an exchange of ideas and keeps the relationship alive. It enriches both of us and lets me be part of the evolution of the person’s work. The artist’s authenticity must be heart-felt, and that can’t be faked. It’s about connection, not just the piece. Creativity is a gift you can’t own it. Mindy Yanish is proprietor of Offerings Contemporary American Craft & Fine Art Gallery located in Katonah, New York north of New York City. 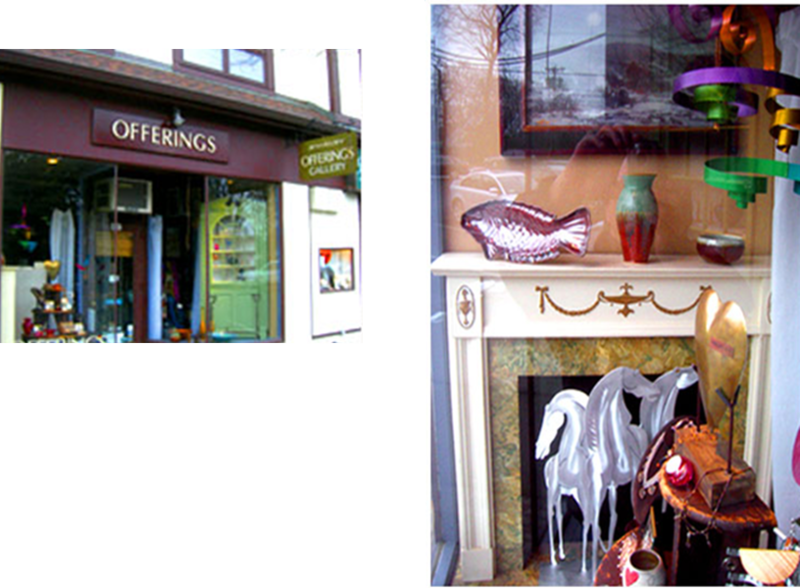 Offerings specializes in local art as well as American hand-made jewelry and antiques, collectibles and contemporary fine crafts. Mindy holds a Master’s Degree in painting from the School of Visual Arts.